The GDevCon Alliance was formed in 2017 by 10 international companies, with the goal of creating an entirely independent LabVIEW conference. The conference is built upon the several core values. Most importantly, it’s independently organised. That means there is no possibility of any influences or biases due to sponsor pressure. In addition, the topics are entirely democratically chosen and discussed. This benefits the community. GDevCon was created to be the “User Group of User Groups”. In essence this encourages integration into the community. Above all, attendance is open to anyone, anyone is free to volunteer for presentations. These principles both strengthen individual ties to the whole LabVIEW community and the ties between teams and companies. The main focus of GDevCon is tackling practical challenges. This way the conference helps developers to better face all the requirements of real-life projects. The very first GDevCon happened this year in early September. Hosted in the heart of the “Silicon Fen”, the location couldn’t have been more perfect, as Cambridge is one of the innovation epicentres of Europe. The presentations were varied in topics, from programming practices to industry applications. Every single one was engaging and noteworthy. A very important thing about GDevCon was its running theme, #OurGiantsAreFemale. This initiative was started by Fabiola De la Cueva, founder of Delacor and presenter at GDevCon. Every presenter chose a female role-model and explained her contributions and achievements. Read her insightful article, that started it all on the Code Like a Girl blog. After overcoming one of the largest hurdles of presenting – getting a foreign audience to pronounce your name correctly – Joerg started out by telling the audience about the life of Dr. Erna Schneider Hoover, an influential mathematician. Dr. Hoover earned one of the first software patents ever issued. As a result, she revolutionised modern communication by inventing a computerised telephone switching method. Moreover, she was also the first woman supervisor at Bell Labs. Dr. Hoover’s work was closely linked to Joerg’s main topic, she identified and prioritised processes. This is an early example of best practices in development. Afterwards, Joerg dived right into the world of software development best practices. He started by detailing what exactly constitutes a successful project. This seems fairly self-explanatory, but it actually isn’t. Success is always a matter of perspective and isn’t always readily visible. 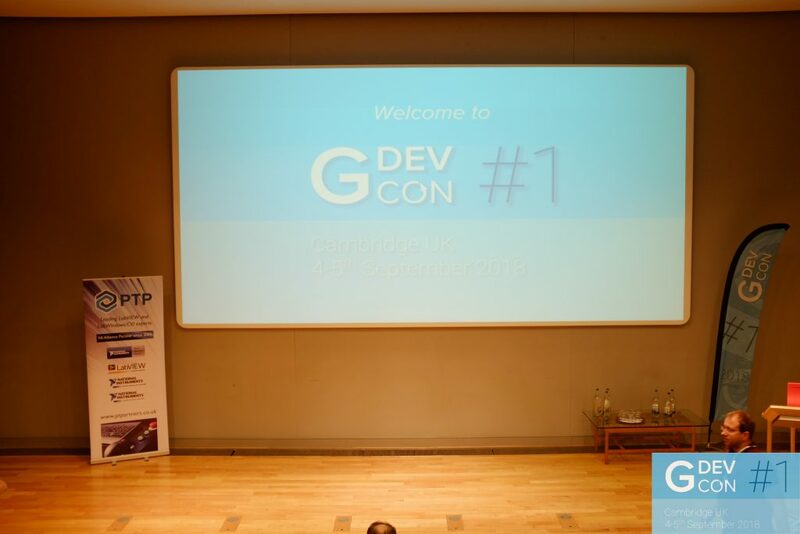 The GDevCon team had all the presentations recorded and they are now freely viewable on Youtube at bit.ly/GDevConYT. The photographer, Malcolm Myers also took many more photos, capturing a lot of interesting moments. Check out the official GDevCon Flickr page at flickr.com/photos/gdevcon. Due to the overwhelming success of GDevCon #1, the Alliance is already organising its follow-up. GDevCon #2 will take place in the one of the industrial centres of the UK, Birmingham, on 21st and 22nd of August 2019. Please get in touch if you wanna present, sponsor or get involved in any other way! As always, we are looking forward to meeting you there! Pingback: GDevCon #1 – The first independent conference on graphical programming – Alliance of LabVIEW™ Architects.